Even if you don't like this novel, you can't deny it is striking. From the very beginning, it is written in second person, not addressing an acquaintance of any sort but, you, The Reader. You will either become enraptured by it and glue yourself to the pages - like I did - or simply find a completely cold pointless exercise, throwing the book across the room, dismissing it as one of the 'Books You Needn't Read' that Calvino enlists in the first few pages. 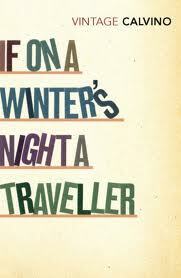 Italo Calvino has just published a new book called If on a Winter's Night a Traveller, but The Reader finds out that the copy is faulty. At the bookshop he finds a female reader, Ludmilla, and they exchange numbers. However, each new book he arrives at isn't the one he was hunting, one book leading onto the next, each one confounding you, The Reader. None of the books bear any relation to one another. Each time you land upon them, you pour over them. They are incredibly fascinating yet stem from completely different genres - satires, travel writing, diary entries, magic realism, Borgesian oddities, even describing a fictional country called Cimmeria. However, each time you become interested in these narratives, you are abruptly interrupted and diverted to new reading material. Everything becomes deceptive; all fiction seems apocryphal and misconstrued; you chance upon a writer who can get you out of this rut; you end up in a South American country where, once more, you are imprisoned and can't seem to escape from this surreal maze. The ten books you encounter upon are impeccably written and will leave you with a thirst for more. One of my personal favourites, Juan Rulfo's Pedro Páramo, is paid homage to in 'Around an Empty Grave'. This writer, being the miserable lonely sod that he is, saw himself in the epistolary Kafkaesque 'Leaning from the Steep Slope'. There will be something for you to gorge on, too, Reader, a piece of writing that will resemble one of your personal favourite or resemble your personal life. I, too, was caught up in this delirious cat-and-mouse game that is If on a Winter's Night a Traveller Reader, and found it to be a true heart-felt, emotionally-involving venture - completely devoid of the cold distant meta-fiction posturing it may be accused of. I couldn't recommend it enough, Reader, and I hope you enjoy it as much as I did.